The Atari 7800's small library doesn't make it terribly exciting to collect for. But it is one of those game systems that one can build a relatively complete collection for without too much trouble. 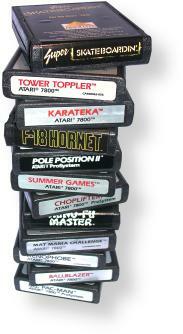 Ironically, most of the hard-to-find titles for the 7800 were also produced by Atari. These include games like Fatal Run, Mean 18 Golf, Planet Smashers, and Motor Psycho. The rarity scale is a general indicator of how easy or difficult it is to come across a game. The scale starts at 1 (very easy to find) and finishes at 10 (nearly impossible to locate). Thanks to auction sites such as eBay, even extremely rare games come up for auction frequently enough, but these often command a fairly high price depending on the rarity. If you have any comments about the listing of a title or its rarity, please post them to the Rarity Guide Message Board. If you'd like to see all titles, simply click on Begin Search without modifying any of the default values.